Lead your people to victory! 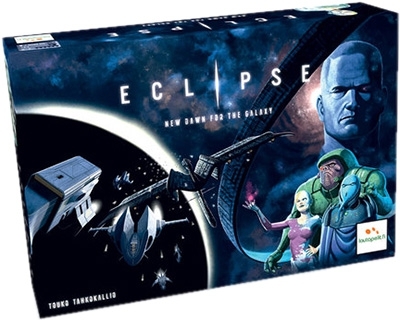 A game of Eclipse places you in control of a vast civilization, competing for success with its rivals. On each game round you expand your civilization by exploring and colonizing new areas, ressearching technologies and building spaceships to wage war with. 37 sector hexes, 6 player boards, 1 supply voard, 96 technology tiles, 154 ship part tiles, 21 discovery tiles, 22 colony ship tiles, 21 ancient ship tiles, 1 center defenses system tile, 32 reputation tiles, 27 orbital/monolith tiles, 2 crowded hex tiles, 6 summary cards, 1 traitor card, 4 info cards, 18 6-sided dice, 18 storage marker octagons, 12 purple damage cubes, 1 starting player marker, 1 round marker, 2 cloth bags. For each player: 14 plastic spaceship miniatures, 4 starbase tiles, 33 population cubes, 16 influence discs, 3 ambassador tiles. Amazing game! I love the depth and choices you have as you build your empire; the game will always unfold quite differently. Surprisingly, for a game with as many rules as it has, we almost never had to reference them during our play. Everything works pretty seamlessly!